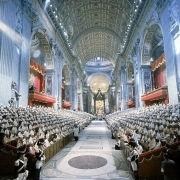 The Second Vatican Council (or Vatican II) was the 21st Ecumenical Council of the Catholic Church. The Council, through the Holy See, formally opened under the pontificate of Pope John XXIII on October 11, 1962, and closed under Pope Paul VI on the feast of the Immaculate Conception in 1965. Vatican II had about sixteen basic documents in the form of constitutions, decrees, and declarations. Preparations for the Council took more than two years There were four working sessions of the council. The Council Fathers seated during the Second Vatican Council…. The Pope opened the Council in a public session and read the declaration Gaudet Mater Ecclesia before the Council Fathers. On the 13th of October the members of the the ten conciliar commissions were elected. Each would have sixteen elected and eight appointed members of the preparatory commissions, where the Curia was heavily represented. Senior French Cardinal Achille Lienart addressed the Council, saying that the bishops could not intelligently vote for strangers. He aksed that the vote be postponed to give all the bishops a chance to draw up their own lists. This movement was seconded by Josef Frings and the vote was postponed. In the bishops meeting to discuss the membership of the commissions both in national and regional groups, they discovered that a significant change had occurred: membership in the Catholic Church had increased in areas from central and Northern Europe, instead of countries such as Spain or Italy. The very first meeting of the Council adjourned after only fifteen minutes. After the adjournment on December 8, the preparations for the Second Council were halted upon the death of Pope John XXIII. Since an ecumenical council is automatically interrupted and suspended upon the death of the Pope until the next pope orders the council to be continued or dissolved, Pope Paul VI was elected only 18 days after Pope Johns death and he immediately announced that the council would continue. Pope Paul VI discovered “problems” of organization and procedure that had been made during the first Council. These included inviting additional lay Catholic and non-Catholic observers, reducing the number of proposed schemata the seventeen, and later eliminating the requirement of secrecy surrounding general council sessions. 1. To define more fully the nature of the Church and the role of the bishop. 2. To renew the Church. 3. To restore unity among all Christians, including seeking pardon for Catholic contributions to separation. 4. And to start a dialogue with the contemporary world. During this period the bishops approved the constitution on the liturgy (Sacrosanctum Concilium)iand the decree on the media of social communication (Inter Mirifica).ii Work went forward with the schemataiii on the Church, bishops and diocese, and ecumenism. The second period ended on December 4. In between the second and third periods, the proposed schemata were further revised on the basis of comments from the council fathers. On September 14 the Council Fathers worked through a large volume of proposals. Schemata on ecumenism (Unitatis Redintegratio),v the official view on Protestant and Eastern Orthodox “separated brethren,” the Eastern Rite churches (Orientalium Ecclesiarum),vi and the Dogmatic Constitution of the Church (Lumen Gentium),vii were approved and promulgated by the Pope. Schemata on the life and ministry of the priests and the missionary activity of the Church were rejected and sent back to commissions for complete re-writing. Work continued on the remaining schemata, in particular the Church in the modern world and religious freedom. Because of controversy over revisions of the decree on religious freedom there was failure to vote on it in the third period. Pope Paul VI opened the last period of the Council on September 14 with the establishment of Synod Bishops—this more permanent structure was intended to preserve close cooperation of the bishops with the Pope after the council. The first business of the fourth council was the consideration of the decree on religious freedom, Dignitatis Humanae,viii one of the more controversial of the conciliar documents. The council gave final approval to other documents and had been considered in earlier sessions: decrees on the pastoral office of bishops, life of persons in religious orders, education for the priesthood, Christian education (Gravissimum Educationis),x and the role of the laity. One of the more controversial documents was Nostra Aetate, which stated that the Jews in the time of Christ, and all Jews today are no more responsible for the death of Christ than the Christians. A major event in the final days of the council was the act of Pope Paul and orthodox Patriarch Athenagoras in a joint expression of regret for many of the past actions that had led up to the Great Schism between the western and eastern churches. On December 8 the Council was formally closed and the bishops professed their obedience to the Council’s decrees. To help carry forward the work of the Council, Pope Paul had earlier formed a Papal Commission for the Media of Social Communication to assist bishops with the pastoral use of media. He also declared a jubilee from January 1 to May 26, 1966, in order to urge all Catholics to study and accept the decisions of the council and apply them in spiritual renewal. He changed the title and procedures of the Holy Office, giving it the name of the Congregation for the Doctrine of the Faith, as well as the titles and competences of other departments of the Roman curia. Lastly, he made permanent secretariats for the promotions of Christian unity, for non-Christian religions, and for non-believers. ii. The Inter Mirifica Decree included pastoral directives to use media as a witness, included church policy on media, overturning previous Church position about liberty of the press (oppressing it because some media was poisonous to the public), but it was not completely overturned because of pope Benedict XVI who accused mass media of producing “poison”), and influencing social communications and later documents pertaining to other decrees about the variety of freedom allocated to it. iv. 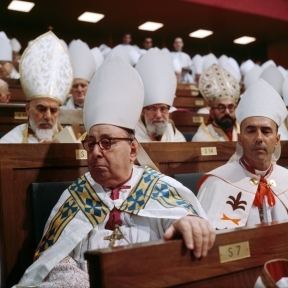 One of the most important interventions in Vatican II, made before the assembly of more than 3,000 Bishops, was that of Card. Joseph Frings, Archbishop of Cologne. In it, he strongly criticized the methods of the Supreme Congregation of the Holy Office, renamed after Vatican II as the Congregation for the Doctrine of the Faith. Card. Frings’ intervention received a standing ovation by the majority of the assembly, primed to give this response. v. Unitatis Redintegratio is the Second Vatican Council’s Decree on Ecumenism. It was passed by a vote of 2,137 to 11 of the bishops assembled and was promulgated by Pope Paul VI on 21 November 1964. The title in Latin means “Restoration of Unity” and is from the first line of the decree, as is customary with major Catholic documents.It contained views on policy revisions, problems of reformation communities, and problems of separated brethren. vi. The decree recognizes the right of Eastern Catholics to keep their own distinct liturgical practices. It also exhorts Eastern Catholics to “take steps to return to their ancestral traditions.” This aspect of the decree was directed against Latinisation. vii. One of the principle documents of the Second Vatican Council. It includes the following information; Ecclesiology, People of God, Collegiality, Priesthood of the faithful, Universal call to Holiness, Mariology, Issues surrounding the document, Conservative reaction. viii. The abstinence from food and drink for one hour before receiving Holy Communion. Originally this meant complete abstinence even from water and medicine from midnight. Only those receiving viaticum were dispensed from this law. Pope Pius XII in 1953 reduced the fast to complete abstinence from solid food but permission for liquids (except alcohol) up to one hour before Communion. Pope Paul VI in 1964 further reduced the precept to complete abstinence up to one full hour before actually receiving Communion, but allowing water and medicine to be taken any time up to reception of the sacrament. In 1973 the Holy See further reduced the fast to fifteen minutes before Communion for the sick and advanced in age, and for those attending them if the hour’s fast would be too difficult. ix. The decree established that all persons have a fundamental right to religious liberty, that the state has a responsibility to uphold this, and that the declaration has its roots in divine revelation, therefore Christians are called to an even more conscientious respect for religious freedom. The key issue was not religious freedom itself: almost all parties in the various arguments supported some kind of religious tolerance. The dispute was over the traditional understanding of the relationship of the Catholic Church to secular states and how it supported relations with “confessional” states such as Spain and Italy. The declaration presented a view that fully supported the model of the Church in the United States and the UK, while allowing for confessional states, and freely stated that it was based on development of doctrine from recent popes. Doctrinal development went from being somewhat suspect to a bedrock theological concept with Vatican II. xi. The title means “The Importance of Education” in Latin and includes dictation on the following: The meaning and right to and Education, Christian education, The authors of education, Various aids to Christian education, The importance of schools, The duties and rights of parents, Moral and religious education in all schools, Catholic schools, Different types of Catholic schools, Catholic colleges and universities, faculties of Sacred sciences, Coordination to be fostered in scholastic matters.